Sukhjeet Kahlon has always strived to get involved in social causes, but volunteering with WarmWokers has gotten her to see the world and homelessness through a different lens. “I’m understanding and learning that these individuals are no different than anyone else and it’s not really them-and-us, it’s us all,” she said. Kahlon was one of the dedicated volunteers at WarmWorkers Waterloo’s 2018 outreach event at Kitchener City Hall on Nov. 7. WarmWorkers Waterloo and WarmWorkers Laurier collaborate and work to help the KW homeless community. Homelessness in the KW community is as prevalent as the stigma that surrounds it. An ‘us-them’ mentality exists, but the reality is that homeless individuals are no different from everyone else. “A lot of the time, the stigma around homelessness says that it’s their fault, but that’s not always the case. Often, they ran into a situation that anyone could have run into,” the third year Sociology major at Laurier, and the president of WarmWorkers Laurier, said. 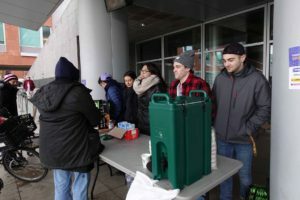 Their outreach events are organized once a semester, where they distribute food and other necessities to members of the KW homeless community while also offering support by simply listening to what they have to say. “There was an individual that has a master’s degree, he was going to go to Harvard, but he went to Laurier on scholarship and everything, but then he got […] a bad head injury that caused serious damage and then from there, it was a trickling effect,” Kahlon recounted a story she heard from a homeless individual at the 2018 outreach event. WarmWorkers is a Toronto-based charity that is focused on ending the cycle of homelessness by bringing homeless people from a cycle of dependency to a cycle of self-sufficiency. Their motto is ‘give a man a fish, feed him for a day, teach a man to fish and feed him for a lifetime.’ The fall semester outreach event is focused on distributing items necessary for getting through the cold winter months like hats, gloves, mittens, and blankets. 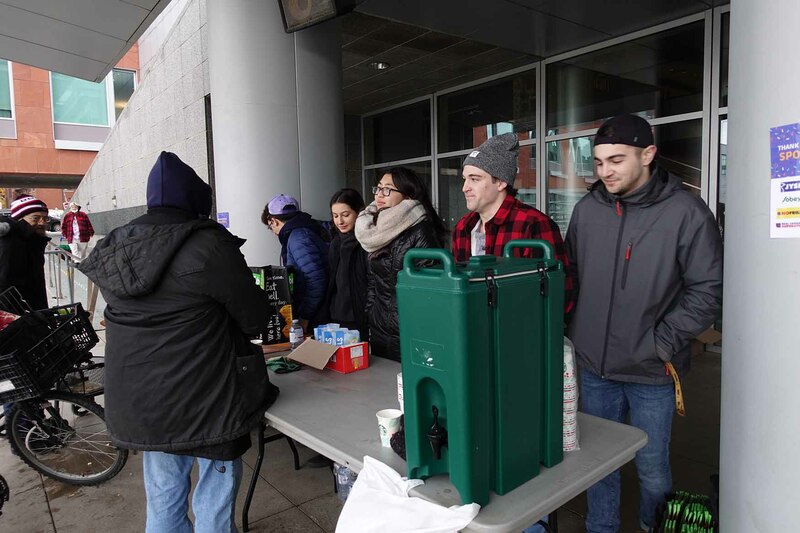 The WarmWorkers spring outreach event typically runs in March, and is geared toward making up for the gap in food donations, as most of the community’s food donations to local food banks and other organizations happen around Thanksgiving. It’s important to remember that those living on the streets have very different priorities. It’s impossible to focus on finding a job or a source of income when one’s basic humans needs are not being met. “As a community, we need to come together and help pick them up so that they can grow from there,” Kahlon said. From there, the charity grew to have chapters at the University of Toronto, McMaster, Laurier, and Waterloo.